Glasgow's rapid growth as an industrial city in the 19th and 20th centuries created a legacy of poor, cramped housing, with frequent bouts of high unemployment. The social problems were probably at their worst in the Gorbals area, just south of the river Clyde. This is where Glasgow got its reputation as "No Mean City" (the title of a book set in 1930s Gorbals) and gang fights with open razors as weapons. After the Second World War, attempts were made to rehouse those in sub-standard tenement blocks by moving them to new estates on the edge of the city - though the sprawling local council estates of Castlemilk, Easterhouse, Pollok and Drumchapel created just as many social problems. In the Gorbals, the old buildings were demolished and new high-rise flats arose in their place - as filing cabinets for people. The old community spirit of the area was thus largely destroyed. In recent years, some of the high-rise blocks have been demolished and rows of modern low-rise flats are being built. Hopefully, this second attempt at regenerating the Gorbals will be more successful. 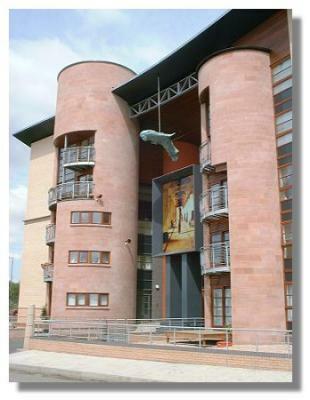 The picture here is of the artwork "Gorbals Guardian" which is located on the edge of the area, amongst some of the new housing. I assume this was quoted from The Guardian? There seems to be 2 examples of artwork within the image - a mobile, presumably of the "fish that never swam", and a collage or painting. This would be would be amongst the ugliest modern builings I've ever laid eyes on - though I'm unsure as to whether the pink cylinders are meant to be part of the "artwork". Or is the whole thing the artwork, & not a building at all? Lets go back at bit earlier!.The Gorbals was originally a village in the Parish of Govan from which is was disjoined in 1771!. The village was a anciently serving as an isolation colony for lepers. Formal annexation to the city came in 1846 and for the century the tenements of Gorbals got the reputation for bad housing, drunks,crime and poverty. Got a few friends who grew up there. New Gorbals is an interesting and thriving community and virtually nothing of the old Gorbals, with the exception of the St Francis Centre, still exists. Much of Basil Spence's architecture of the Sixties has also gone and the housing is now a mix of private flats and town houses with some affordable rental properties owned by the Glasgow Housing Association. I visited the new Gorbals library last weekend and I was impressed not only by the facilities but by the number of local kids who were using these facilities.  You will even find an alternative view of Bardau's ugliest building on this site! I'm sorry - I did not mean to sound so unkind. Beauty is in the eye of the beholder, after all. I did live for a very short period of time in the Gorbals when VERY young, & I don't remember much about it. But we must have lived elsewhere in Glasgow before that, for I do remember being upset because there were no trams running past! And I seem to remember reading that there was no vehicular traffic allowed in Gorbals. Maybe I'm mistaken on that point though. ee bxxxxxd. my mum is in her 70s now and she doesn't keep to well but she,s still nostalgic for the old Gorbals,she left there years ago ,but her heart is still there.Sorry for going on a bit ,hope you dont mind.If anyone remembers anyone ive mentioned or lived there ,put a reply up.We were the Eadie family if that helps. Prior to living in Kinning Park (see entry under good old KP) I lived at 58 Norfolk Street (1966/68), there was a wee shop at the close, buying a bottle of American Cream Soda and a pack chewing gum, dropping one of the said gum into the ginger and ... whoosh! it scooshed everywhere, brill! Someone has mentioned rats, yep they were as big as cats, but the bu***rs could squeeze into the smallest hole going. I went to Bonnys in the Oaklands, spent more time playing toss a penny there than anything else, the good old days. i was born in the gorbals next to camden st school,havegreat memories of my childhood we knew everyone up every close no one was any better than anybody else we were all in the same boat i still think of all my pals and my brothers pals,in fact just before he passedaway we sat together in his hospital bed wondering what had become of all of them he had a terrible sadness in his eyes all he ever spoke about how he loved the old gorbals and the peoplewhd lived thereat that time. here are a few memorys of growing up ww2 glasgow, in the 1940s I remember being taken to the underground shelter at "grants whisky bond" at the bottom of warrwick street, also the one at the"co-op" in gorbals street, we lived in warwick street,just before bedford street. as kids we played in the bomb shelters that were built in the middle of the street and the back courts. we also sometimes took shelter in the house on the ground floor during an air raid. the family still had gas light, real spooky. this is another part o glesga dear tae mah heart ,got ah wee hoose there when ah first got merrit lived at 286 lawmoor street qite ah few years . i was called up fer national service while stayin there always remember comin hame on leave ,crossin ower the bridge an headin towards ma hoose turnin intae ah street an you coodnae get up it cos aw o the rubble fae the hooses gettin demolished . ma wifes wee maw had ah fruit shop at wan time ,an mah faitherinlaw ran ah fruit van up in polloc there wisnae many shops there at the time he made ah fortune . ps mah 4 kids were aw born in the gorbals ,efter 5 years livin there ah got ah 3 room an kitchen ,livin room ,an inside toilet , man it wis heaven ,garden fer the kids tae play in made ah great difference tae oor wie o life kids seemed tae thrive in this great chinge o enviroment still in the same hoose 50 years later . What memories!! - grandparents lived in Surrey St in mid 50's - my parents in hospital St - into late 60's. Rembember the little chemist shop under the bridge (opp the Granite Bar). the owner was very nice and we use to spend a lot of time in there. 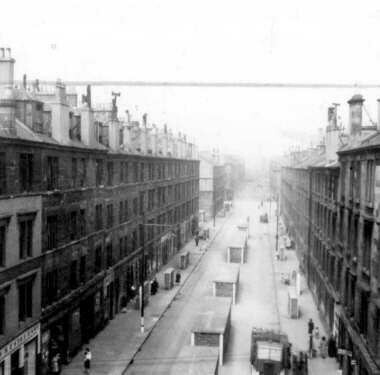 Use to walk down gorbals st into town - it was so safe then!